Faria Rivelino could be forgiven for having split loyalties when France take on Portugal on Sunday night in the Euro 2016 final. The father of the Paris Saint-Germain midfielder Blaise Matuidi moved to Toulouse in the early 1980s with his wife Élise to escape the Angolan Civil War, before eventually settling in the capital. The former colony of Portugal was devastated by the conflict, which lasted until 2002 and resulted in more than half a million deaths. But having grown up in the Parisian suburb of Fontenay-sous-Bois with his four siblings speaking both French and Portuguese, Matuidi was approached in 2006 and asked if he would consider playing for his father’s homeland. “I had to make a difficult choice to opt for the French team,” he said in 2014. “I have never forgotten my Angolan roots. I attached great importance to them, especially as I still have family there. 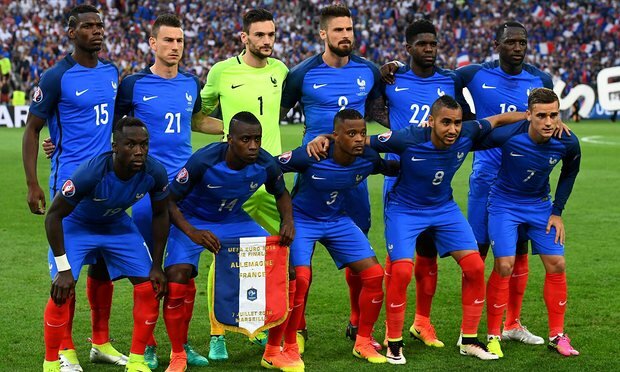 But while Matuidi may be the only player in action at the Stade de France whose family can legitimately support either side, both finalists’ squads have drawn heavily on the children of second generation Africans. The hosts’ squad, whose 1998 World Cup winning team was feted for its “black, blanc, beur” composition, features 11 players with African roots (not including Réunion’s Dimitri Payet), compared with six in Fernando Santos’s Portugal squad. That makes 37% of the two finalists’ squads, while the fact that exactly half of the 24 competing countries at Euro 2016 went into the tournament with at least one player of African descent shows the extent of migration across Europe in recent years. Of course, those statistics have not been well received in all quarters. Marine Le Pen’s far-right Front National party used Karim Benzema’s exclusion from the France squad as an excuse to reignite the debate over race first used by her father, Jean-Marie, before the 1998 World Cup. In 2011 the French Football Federation and then France manager, Laurent Blanc, faced accusations that they had discussed limiting the number of places for players from ethnic minorities at their headquarters in Clairefontaine that would have seen players as young as 12 passed over in order to make room for their white counterparts. But it is not just in France that the presence of so many African players has become an issue. Just before Les Bleusplayed Iceland in the quarter-final, a Danish far-right party posted a message on Facebook featuring images of Paul Pogba, whose parents emigrated from Guinea, and Senegal-born Patrice Evra with the Iceland captain Aron Gunnarsson. “If you don’t think that Europe and Denmark should be transformed into an African backyard, then enter your email address at www.stemdansk.dk so the Danes’ Party can be allowed to run for parliament,” read the caption. Iceland’s Football Association issued a strongly worded statement condemning the post and urging people not to share it. “The common interest of a large chunk of the human race in the sport of football which we so love brings people together. We use sport to bring people together, not split them apart,” its statement responded. Before the tournament the current France coach, Didier Deschamps, was accused of racism by Eric Cantona over the Benzema affair but he could have chosen to start every match with a team of players with African heritage. Aside from Matuidi, Pogba and Evra, the new Crystal Palace goalkeeper Steve Mandanda and Manchester City’s Eliaquim Mangala have roots in the Democratic Republic of Congo while the defender Adil Rami, born in Corsica to Moroccan parents, is the only player in the squad with north African descent. The defender Samuel Umtiti – signed from Lyon by Barcelona last month – was born in Yaoundé, Cameroon, before emigrating with his family at the age of two, with Moussa Sissoko and N’Golo Kanté both of Malian heritage. In stark contrast to the 1998 side which included Thierry Henry and Lilian Thuram, however, only Manchester United’s Anthony Martial of the current generation is descended from France’s former territories in the West Indies. Yet, if the relationship of Les Bleus with its old empire has been under the microscope for decades, Portugal’s Seleção can claim to have a similarly lengthy history of drawing in players from overseas. More than a decade before Mozambique-born Eusébio took them to the 1966 World Cup semi-final against England, Benfica signed his compatriots Hilário, Matateu and Mário Coluna and began a long-tradition of naturalising African talent for the national team. These days Cape Verde has emerged as the richest seam of players with Nani, Eliseu and the new sensation Renato Sanches – who joined Bayern Munich before the tournament for a fee that could rise to €80m – all tracing their roots back to the island in the Atlantic Ocean. After missing the semi-final against Wales due to suspension the Angolan-born William Carvalho is expected to resume his partnership with Sanches and Porto’s Danilo, who was, like the former Swansea striker Éder, born in Guinea-Bissau. In a country which does not keep data on ethnicity or race there are now estimated to be between 200,000 and 500,000 people of African descent – a tiny number when compared to France’s almost eight million. But with Portugal currently rated second on the Migrant Integration Policy Index’s ranking of nations with the best integration policies towards immigrants, there could be plenty more who follow in the footsteps of Eusébio and co in the next few years. Donald Trump’s team has questions about China in Africa. Here are answers.